Soybeans are again trading higher this morning after closing above some key technical levels yesterday afternoon. The Chinese crush margins are some of the best we've seen since early-Spring and the bulls are hoping to see continued strength in demand from the Asian giant. U.S. weather remains a bit wet and the harvest has already fallen behind it's normal pace. From a technical perspective, the NOV17 contract is starting to run into an area between $9.80 and $10.20 that has caused some difficulty in weeks past. We also have to keep in mind we've added close to +40 cents from last weeks low and we are on the midst of harvesting our largest crop ever...perhaps the market is trying to tell us something? The USDA reported yesterday that the US. harvest is currently about 4 percent complete vs. 6 percent last year vs. 5 percent on average. Interesting to note, back in 2012 we had over 20 percent harvested by this date. Bottom-line, all of the major producing states are running behind their traditional average historical pace. 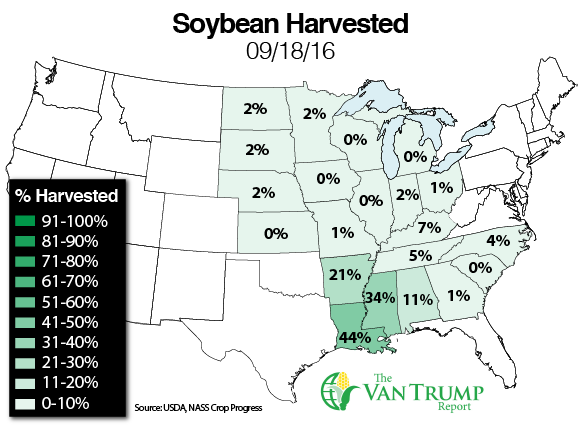 Crop conditions were left "unchanged" at a record 73 percent reported "Good-to-Excellent". Keep in mind Illinois conditions are now 80 percent and Iowa 81 percent "Good-To-Excellent". As a producer I continue to like the thought of making sales into the rally, especially on all the "overage" that will be harvested.